Women account for only seven percent of all the active and participating investing partners in the top hundred venture firms globally, according to a report released this week. And only 38 percent of the top hundred venture firms have any female investment partners at all — 28 percent of the firms have only one and 7 percent have two. In total, there are only 53 women as investing partners out of a total of 764 partners. Smaller firms don’t do much better. Women account for 8 percent of investing partners in the 2,300 firms listed as micro-venture firms in CrunchBase that have been active since 2014. However, women make up 12 percent of all investing partners in the 101 accelerators and 54 corporate venture firms that have been active since 2014. Floodgate, Scale Venture Partners and Greycroft Partners, do the best, with at least a third of their co-founders being female. They are the only firms that qualify as female co-founded in the top 100 venture firms around the world, says the report. Floodgate has two female investing partners who make up 50 percent of the total number of partners and thus leads all the 100 firms with regard to firms with highest percentage of women partners. Another 14 firms have 20 percent or more female partners. 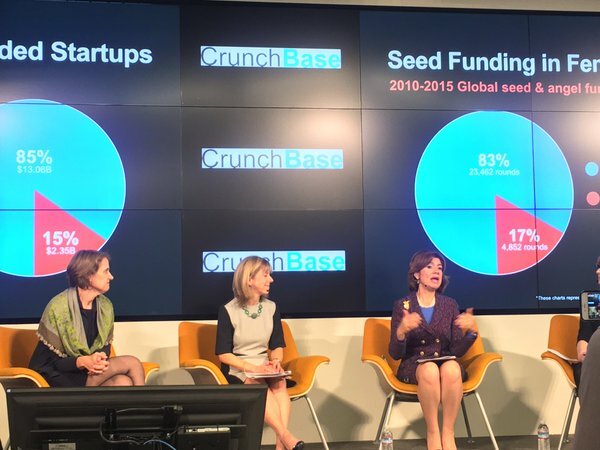 Scale Venture Partners and Greycroft Partners tie at 33 percent each. However, with regard to ranking based on the number of women in each firm, NEA is at the top with five women as investing partners in a single firm, and all partners are based in India. Shanghai-based Qiming Venture Partners is second with four women investing partners, while Canaan Partners has three, and China-based Sequoia Capital has two. Women co-founders are more likely to hiring other women as partners, according to the report findings. Women make up to half of all partners in 29 firms that have at least one female co-founder. The number of start-up firms having at least one female co-founder increased from 9 to 18 percent between 2009 to 2014, indicating that female co-founders could do better when it comes to funding. A small number of firms that made a high number of rounds of investments to female-founded firms were either started by a woman or have relatively high percentage of women as investing partners. These firms include Greycroft Partners with a total of 36 rounds, Canaan Partners with 33 rounds, Upfront Ventures with 21 rounds, Kapor Capital, and Converge Venture Partners. 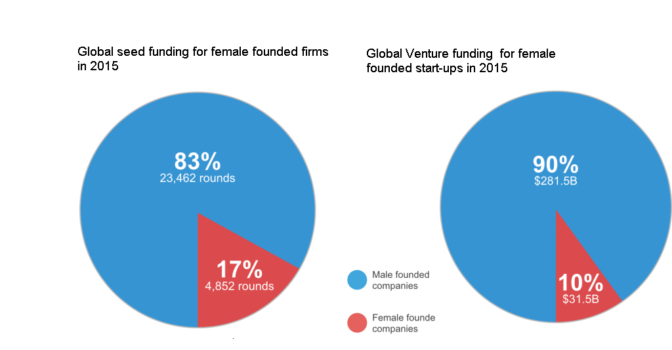 Startups with at least one female founder received a total of $31.5 billion, or about 10 percent of all venture funding distributed globally between 2010 and 2015. This translates to just 12 percent of all 3,265 venture funding rounds. A slightly larger amount of seed and angel funding, or 17 percent, a total of $2.35 billion, went to start-ups having at least one female founder. Almost half, or 45 percent of firms that invest more than average in firms with female-founders have at least one female as an investing partner. MassChallenge, which has a female managing director, recorded the highest number of rounds made to firms that have at least one female founder, at 42 percent of its total portfolio. However, SOSV, VTF Capital and Metamorphic Ventures, four of the five top rated firms in terms of percentage of total rounds made to start-ups that have a female founder, do not have any females as partners in their administrative. This suggests that women founders looking for funding do not have to wait for venture capital firms to bring on female partners. David Kariuki is a technology journalist who has a wide range of experience reporting about modern technology solutions. A graduate of Kenya's Moi University, he writes for Hypergrid Business, Hyperica, and Cleanleap, and has previously worked for Resources Quarterly and Construction Review.